On October 31, 2004, I began my journey to the Lakes of the Rift Valley located in Kenya. Though I’ve travelled to many parts of the world, this would be my first time to Africa. I would be flying for a total of 19 hours and crossing 11 time zones. 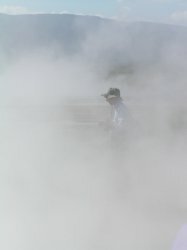 The thought of sitting for that long time and slowly being dehydrated by dry plane air was of a concern. Purchasing Metamucil ® biscuits, the ultimate in traveller’s aides, would be essential. 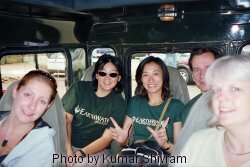 I would be joining a team of 6 other volunteers from different parts of the world and 5 researchers to assist in scientific research supported by the Earthwatch Institute (www.earthwatch.org). Four of those volunteers turned out to be other HSBC employees from the UK, China and India. 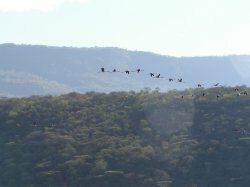 While in Kenya, I would assist in data collection for three projects and learn about the conservation challenges and ecological issues facing this region, and in particular, that of Lake Bogoria where we would concentrate our research. Special note: A big thank you to HSBC for sponsoring my trip! This was an opportunity of a lifetime! The region known as the Lakes of the Rift Valley was formed by a geologic phenomenon that occurred approximately 20 million years ago. The earth’s crust violently broke apart and created a rift that ran for thousands of miles north and south, dividing what is now known as Kenya. The land on the sides pulled away in opposite directions and rose up to form great volcanic mountains, new watersheds and a series of lakes whereas the land in the middle sank to form a valley. Lake Victoria, the largest African freshwater lake, can be found on an Equatorial plateau in this valley. This geologic event permanently changed the course of the rivers in the area. The waters from the Congo that had once flowed East now flowed in the opposite direction and Lake Victoria became the source of the Nile River. Lake Bogoria is a National Reserve located in the eastern part of the Rift Valley. 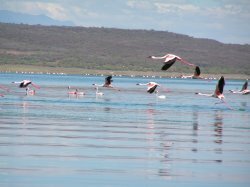 The primary research emphasis to gain an ecological understanding of this inland body of water and the health of the Lesser Flamingo and their migration patterns between this lake, Lake Nakuru and other soda lakes. 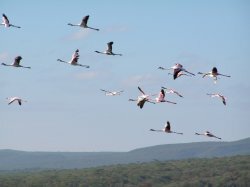 Periodic, large-scale die-offs of the Lesser Flamingo at Lake Bogoria and Lake Nakuru have been recorded over the past 40 years. At one time, the flamingo population was around 2 million. But today, the number is half of that. 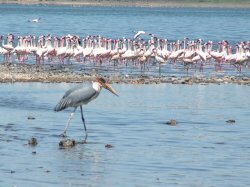 Initial speculation was that the flamingos were starving, but recent information attributes the deaths to 4 other possible explanations: Avian tuberculosis, parasites, toxic algae and at Lake Nakuru, heavy metal contamination. Researchers continue to track weekly, the number of dead flamingos in the lake and conduct autopsies on recently dead, but seemingly healthy birds. The primary food source of the Lesser Flamingo is Spirulina, which is a type of blue-green micro-algae and also happens to be the only organism that actually lives in this alkaline lake. You may have heard of Spirulina before. It is sold as a source of supplemental protein often marketed to vegetarians. In contrast, the Greater Flamingos feed on the Lake Fly larvae, which live in the lake bottom, no more than 4 meters down from the lake’s surface. The larvae feed off of the decaying Spirulina. As part of our volunteer activities, we helped collect lake water samples to record the changing Spirulina concentration and collect lake bottom samples along various transects to ascertain the Lake Fly larvae location and concentration. 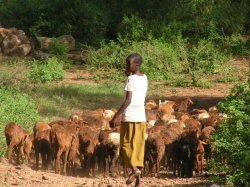 Lake Bogoria’s importance to the local peoples is tourism and grazing land. It is primarily a soda lake, but has fresh-water stream inflows on the southern and northern ends and in selected spots on the western edges where hot springs percolate. 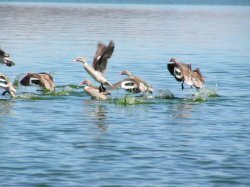 The Lake also supports numerous indigenous and migratory bird species. While there, I saw ostrich, warthogs, baboons, turtles, pelicans, Tawny Eagles, Cape Teals, Greater and Lesser Flamingos, Maribou Storks, swallows, Dik Diks, Grant’s Gazelles, zebras and water buffalos. I spotted leopard prints along the lakeshores, a few snakes and more species of other birds and insects than I could possibly remember or name. Tourism keeps the area economically afloat and serves to educate foreigners and locals alike about this valuable natural resource. However, visitors in caravans, on the water and on foot exert negative pressures threatening the overall health of the ecosystem. 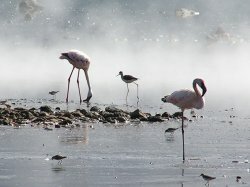 Tour buses spew fumes of burning oil and of faulty exhaust systems, people toss their non-biodegradable litter on the ground, and the presence of people and the vehicles disturb the flamingos and other wildlife, forcing them to use up precious energy away from resting, feeding and breeding. It has been acknowledged that the Earthwatch project team’s presence while collecting lake water and mud samples out on a boat powered by a sputtering, noisy gas motor significantly disturbs the flamingos and pollutes the water. I wished we had canoes or kayaks. 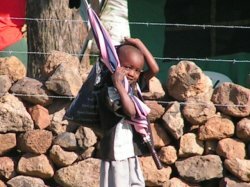 The vast majority of the local Kenyans are poor farmers. They live week to week if not day to day. Fresh water is scarce in this area, the rainfall low and little edible vegetation grows in this hot, arid climate. 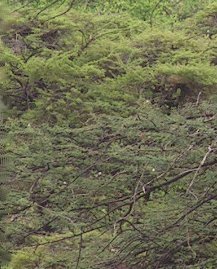 Roaming untethered and unwatched, herds of goats and cows and flocks of sheep strip the lower branches of the thorny Acacia trees. They turn trees into sprawling shrubs, eat young seedlings, rip grass from their roots and pound the earth so tightly with their hooves that seeds cannot take hold and germinate. The feeding habits of these animals have changed the lower and mid-canopy forest and density. The earth is more exposed, fewer roots exist to hold the soil, and likely, from a microclimate perspective, the evapotranspiration cycle disrupted. During my travels in the Reserve and in other areas in the Rift Valley by vehicle and by foot, I’ve seen eroded hillsides, 10 to 15’ deep canyons formed by the forces of water carrying soil away that is not protected by roots of trees or shrubs, and tons of soil washed away muddying the rivers and lakes. 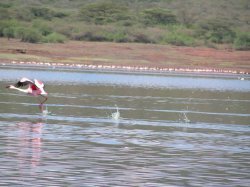 The Reserve’s well-respected Park Ranger, William, is making strides to encourage the farmers to not allow their herds graze close to the lake where erosion has a greater impact on the health of the lake and therefore on its biggest tourist draw, the flamingos. He is also helping the local population make the link between littering and their livelihood. Often, the farmers’ livestock die or become ill from eating garbage found on the ground. Several villages have already started programs to prevent littering and encourage all to pick up garbage on the ground. However, like many developing countries, there is no established sanitation system. People bury their garbage, haphazardly toss it or burn it. Burning plastics release toxic by-products that pollute the air, water and soil and the area’s inhabitants. William knows that a well-defined park management conversation plan is a must but will take time to implement. There are many challenges along the way in order to balance the economic needs of the people and the needs of the animals, birds, insects and plants. Education will be needed to change the peoples’ behaviors, values and attitudes. New skills must be taught to support job creation related to eco-tourism. Revenue generated at the Park should be funneled back into the Park and the local community instead of all of it flowing into the country’s General Fund. The research assignments were split into three components: Lake Flies, Birds, and Moths. Teams of 2 or 3 volunteers were paired with the lead researcher(s) for each module.